Deane Juhan has CANCELLED the August 15-16, 2018 Trager workshop at Central Maryland School of Massage in Frederick, Maryland. 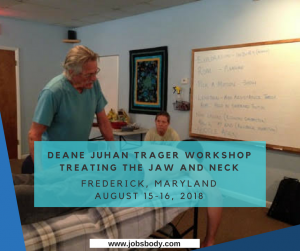 The workshop focuses on Treating the Jaw and Neck (Trager Fundamentals and Resistance and Release Work). Resistance and Release work is designed to re-coordinate our musculature as a whole and to train more efficient and effective recruitments of muscular contractions and lengthening involved in any position or movement, from feet to head and from sleeve to core.